Walks in the Yetholm Area. Many people visit Yetholm to enjoying walking in the beautiful surrounding countryside. 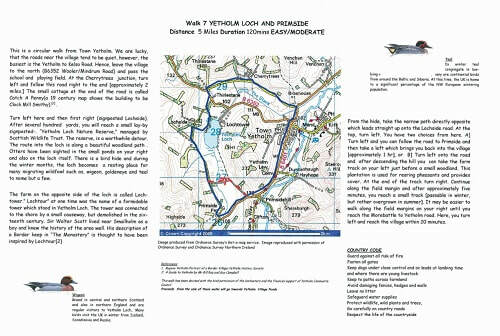 This page provides some information that may help you when planning walks in the area. Scottish Borders Council have produced a number of excellent walking guides for the entire region. 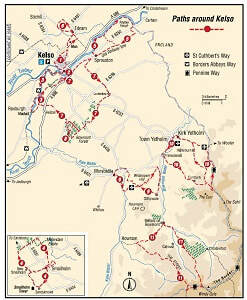 The booklet describing paths around Kelso has eleven walks which might be of interest to vistors to Yetholm. 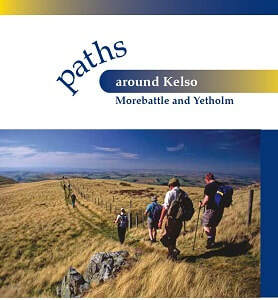 The Guides are available to buy in Tourist Information centres, but can also be downloaded free as a PDF - click HERE for Paths Around Kelso, Morebattle & Yetholm. Yetholm's Floral Gateway Group, who look after flowerbeds in the village and also the Conservation Area below Dow Brae have produced a series of laminated walks around the Yetholm area - an example can be seen below. They can be bought in the Village Shop as individual sheets or as a pack - just ask at the counter if you can't see them on show! Yetholm Past and Present, A Walking Guide. 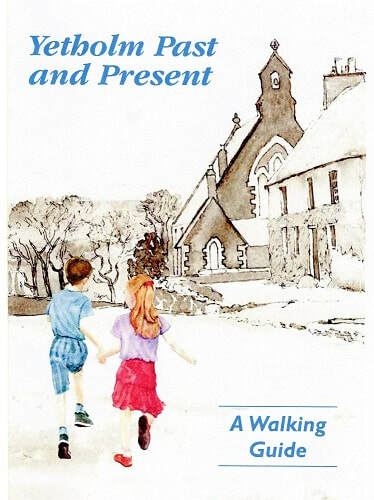 A illustration from Yetholm Past and Present - A Walking Guide, by local artist Janet Canning. 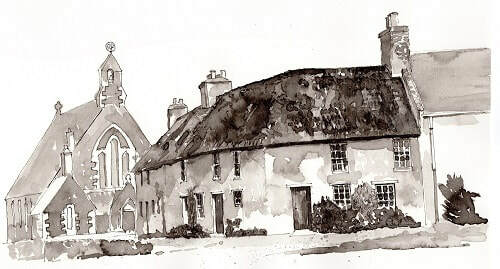 It shows the old cottages at the top of Dow Brae in Town Yetholm, with the old Free Church in the background. Yetholm is at the start/finish of two of Britain's most famous long-distance walks - the Penine Way and, more recently the Scottish National Trail. It is also at the mid-way point of the very popular St Cuthbert's Way, which runs for 60 miles from Melrose to Holy Island. In addition to the walk itself, the official website for the St Cuthbert's Way has produced an excellent booklet called Short Walks off St. Cuthbert’s Way Guide includes detailed route descriptions for 24 short walks, each including a section of St. Cuthbert’s Way. All the walks are of interest to someone staying in Yetholm. The full-colour guide includes OS based 1:25,000 maps, and provides essential information such as parking, public transport, refreshments and what you can expect to ﬁnd and see along the way. The booklet costs £9.99 and is available HERE. If you are interested in the Scottish National Trail, the 537 mile walking route running the length of Scotland from Kirk Yetholm to Cape Wrath, you can find out more HERE. Info about the Penine Way can be found HERE. If you are feeling energetic you can always combine the two trails - some people do - which would make a grand total of 805 miles. However, if you don't have much time available, you might consider running The Spine, which bills itself as 'Britains most Brutal Race' - and involves running the Penine Way non-stop in the depth of winter. A few people have managed to do it in 80-90 hours. Find out more HERE.